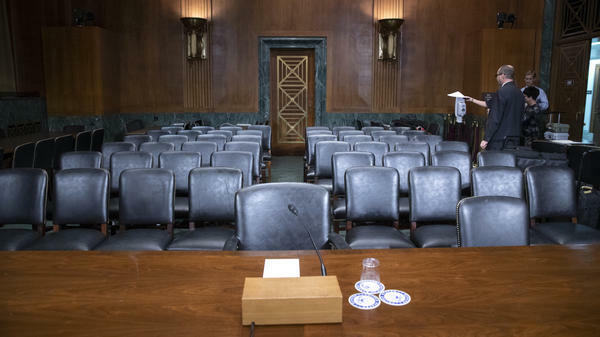 The Senate Judiciary Committee hearing room is prepared for Thursday's planned testimony from Christine Blasey Ford on Capitol Hill. I wanted to have a second front door, I described the assault in detail. I recall saying that the boy who assaulted me could someday be on the U.S. Supreme Court and spoke a bit about his background. My husband recalls that I named my attacker as Brett Kavanaugh. After that May 2012 therapy session, I did my best to suppress memories of the assault because recounting the details caused me to relive the experience, and caused panic attacks and anxiety. Occasionally I would discuss the assault in individual therapy, but talking about it caused me to relive the trauma, so I tried not to think about it or discuss it. But over the years, I went through periods where I thought about Brett's attack. I confided in some close friends that I had an experience with sexual assault. Occasionally I stated that my assailant was a prominent lawyer or judge but I did not use his name. I do not recall each person I spoke to about Brett's assault, and some friends have reminded me of these conversations since the publication of The Washington Post story on September 16, 2018. But until July 2018, I had never named Mr.
Kavanaugh as my attacker outside of therapy.